Words, pictures, numbers, facts, graphics, statistics, specks, waves, particles, motes. Only a catastrophe gets our attention. We want them, we need them, we depend on them. As long as they happen somewhere else. This is where California comes in. Mud slides, brush fires, coastal erosion, earthquakes, mass killings, et cetera. We can relax and enjoy these disasters because in our hearts we feel that California deserves whatever it gets. Californians invented the concept of life-style. This alone warrants their doom. The characters in Don DeLillo’s 1985 novel White Noise are always making amusing and unsettling observations like the one above. Jack Gladney, the main character, discusses with his friends and his family such big issues as consumerism, the media, violence, and the state of the world. Their hilarious and thought-provoking musings are mixed with conversations about how often the characters have brushed their teeth with their finger or what country llamas come from. It’s all a lot of fun to read, but after a while, the deluge of commentary became tedious for me. Much of the satire—a professor of Hitler studies who can’t speak German, yet another list of consumer products—started to seem obvious and shallow. Like so much white noise. Aha! Although I think the characters’ reflections about society and the preposterous incidents each make a point about our lives today, the larger point perhaps lies in the barrage of commentary itself. The characters’ observations about life and death distance them from life and death. Jack is a Hitler scholar and so should be confronted with death all the time, but it remains theoretical, just like those California mud slides. Death and disaster end up on the same level of consciousness as a commercial jingle. Jack is completely unprepared to face death, and he spends the rest of the book trying to put it out of his mind or get the upper hand on it. The story gets more and more preposterous and Jack’s desperation increases. I went from snickering at it to rolling my eyes and back again several times. The book raises a big question—how do we deal with death?—but it’s easy to get distracted from that big question by all the other noise. I believe that’s intentional on DeLillo’s part. Perhaps death is too big a mystery to fully pin down. It can’t be quantified or analyzed or turned into a jingle. But it need not keep us up at night either. After the billowing cloud moves through Jack’s town, the sunsets are more beautiful than ever, probably because of the lingering substances in the atmosphere. People come out to a local overpass specifically to see the colors in the sky. Perhaps the recognition that life is finite can make what life we have even more precious and worthy of our undivided attention. 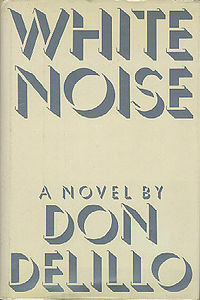 I absolutely loved the book “White Noise.” My favorite part was when Jack engages his son in an argument about how one can tell whether or not it’s raining, fairly early on. Members of our family got a big laugh out of hearing it, because it’s just barely the other side of some so-called intellectual disagreements we’ve heard in our own family over the years, arguments such as “when we all agree we like chocolate, how do we know we’re all tasting the same thing?” and “if they crossed the appropriate wires (nerves? neurons?) in your brain, would you see thunder and hear lightning”? These absurd things are part of the (folk) way families deal with the culture of technology in which we live, and I found the book perfectly hilarious from that point of view. That conversation made me laugh too. It reminded me of a conversation I had when I was 8 or 9 with my cousin and uncle about whether blue looks the same to everyone. I have this book on my shelf and have been meaning to read it for ages having heard it was good. But I had forgotten all about it. So thanks for the reminder! I’ve not read any DeLillo, although I have plenty to choose from on my shelves. This would probably be a good starting point for me. I know he’s one of those Marmite authors – you love him or hate him it seems, I wonder which way I’ll fall. Opinions were all over the place in my book group, but most of the people who didn’t like it overall could still point to individual scenes they liked. As for me, I neither loved nor hated it. I enjoyed White Noise, but one thing I’ve learned with Delilo is that he’s a writer you have to read very fast, not stopping to analyze, letting the sense if the words just flow over you. I find the same is true of Hunter S. Thompson: in order to “get” him, I have to read his work fast. Btw, my favorite scene in White Noise is when Jack hears one of daughters talking in her sleep. He leans over, expecting to hear something profound, but what she’s actually saying is “Toyota Carolla” over and over. I did read this pretty quickly because I was trying to finish in time for book group, although there were parts I wish I’d taken a little more time over. I remember that scene and found it funny too. This is my problem with satire! No matter how good the satire, it gets tedious quickly when it’s longer than, say, “A Modest Proposal”. Is this the Don DeLillo book that everyone thinks is his best one? Because if so I might just give him a miss. Yes, that’s the problem I have with a lot of satire. The joke wears thin after a while. The way the stakes get raised in the story helps with this book, but it didn’t eliminate the tediousness. I think this is DeLillo’s most famous book–it won the National Book Award and it’s the one I’ve heard the most about. But a couple of people in my book group mentioned liking some of his other books better. 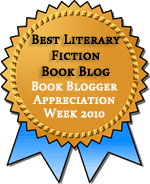 More than 20 years ago, a friend of mine who write SF recommended that I read White Noise because she knew I studied satire and love reading new ones. I hated it. Now I don’t remember entirely why, but I remember mentally classing the writer with the mental category I have for entitled baby boomers. I don’t agree that satire always gets tedious when it’s longer than a few pages. There are some very inventive authors who can perform endless comic variations on their theme, like Voltaire in Candide. I’m sure you’re right that some satire holds up well for many pages, but in my experience, it’s rare. The ability to sustain a good satire is what separates the masters from the middling. I just haven’t encountered many of the masters (although I did enjoy a stage version of Candide a couple of years ago). I strongly disliked this novel, it wasn’t as funny as it tried to be, and I think DeLillo is not the best of prose writers. On the other hand, I rate his Libra very highly. I’m still torn about him, I need to read Underworld to make up my mind about him.